At the risk of triggering some of you, last year’s Las Vegas Bowl is one of those games Oregon Duck fans would like to forget. however, although the offense was inconsistent and ineffective for a good portion of the game, there were some bright spots, one of which is the focus of this article. While re-watching the bowl game, I stumbled upon a play that I’m calling PA Stretch WR Screen. This play is what we would categorize as a “constraint play.” A constraint play is a play that a program runs to strengthen their base plays. Teams use such plays to take advantage of defenders who are “cheating” on plays they’ve seen the offense run multiple times. As a result, constraint plays often look like the base play to begin with, but quickly turn into something else. Above is the Stretch, a play that Coach Mario Cristobal brought with him from the University of Alabama. Going forward, with the introduction of the Pistol as our base offense, I expect the Stretch to be a staple run for the Ducks. The coaching staff must also believe this, as they’ve added a constraint play to aid in the Stretch’s effectiveness. Above is the PA Stretch WR Screen. The play looks just like the Stretch at first, then Justin Herbert turns around and fires a screen for a first down. While watching the play, notice everything the offense does. The offensive line fires off laterally to really sell the run through outside zone blocking. Herbert starts flowing in the same direction of such blocking to mimic the handoff. Even the WR receiving the screen pass begins by blocking the corner in front of him. Everything about what is happening in the first couple of seconds screams Stretch. After the initial movement of the offense comes the screen portion of the play. 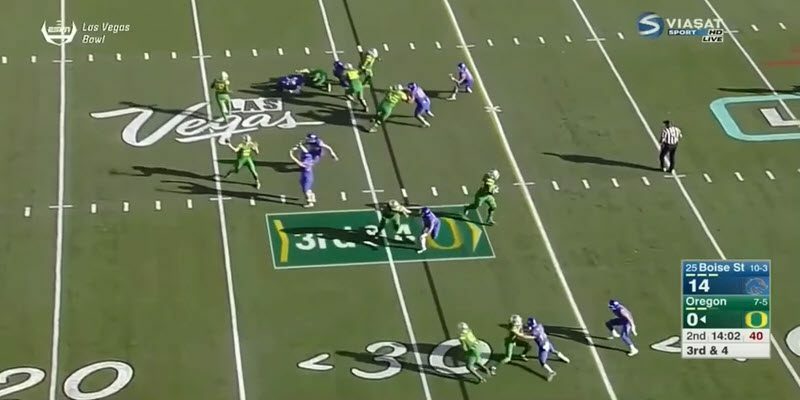 From the footage above, you’ll see that the backside guard and the backside tackle abandon their outside zone blocking and begin to flow in the other direction to block for the screen. The WR abandons his stalk block as the slot receiver takes over on the corner. I think that this is a great constraint play for the Stretch. It really sells the run to the defense, especially if they have seen it a couple of times in the game already. Oregon’s opponents will have seen the Stretch in film study all year, so the PA Stretch WR Screen is even something that the Ducks could use right out of the blocks. I for one cannot wait to see more of the play this coming season, and whatever other constraint plays the staff comes up with.